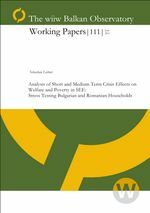 In the analysis short- and medium term effects of the crisis on household income levels by deciles and on overall inequality and poverty measures are described for the period 2008 to 2011 for Bulgaria and Romania. For the subsequent period of 2011 to 2015 we apply household stress tests. Both parts of the analysis are based on EU SILC microdata. Different transmission channels like changes in the labour market structure, subsequent but also independent income effects are depicted, but also the effect of adaptions in the fiscal and social policies of the countries. The analysis shows that relative poverty rose during the economic crisis in Bulgaria in the year 2008 up to 2011, effected not only by a substantial loss in employment, but also by a weak system of social welfare incapable to cushion the effects of the output loss. A further slight rise of poverty rates is estimated for the period up to 2015. In Romania both average income levels but also income inequality and relative poverty declined in the years 2008 to 2011. This is due to the relatively shallow decline in employment during the immediate crisis years and the effects of the introduced austerity measures. The Romanian government has cut progressively public pensions. As in Bulgaria dwindling remittances from relatives working abroad had detrimental effects on household incomes particularly in the lower deciles. The stress tests show that in the period of 2011 to 2015 also in Romania relative poverty will remain persistent. Both Bulgaria and Romania will most probably remain those two EU countries with the highest rates of relative income poverty.